Columbus Family Dental Care is proud to offer residents of Grove City and the surrounding Columbus, Ohio area the highest quality dental care available. Dr. David Dixon is committed to the total dental health of his patients, including restorative procedures to repair damage from injury or disease. For information on restorative and other dental treatments, contact our office, and a team member will be happy to assist you. The goal of restorative dentistry is to return destroyed or lost tooth structure to full form and function. If you have a filling, crown, or dental implant, you are already benefiting from a restorative dental treatment! Today, dentists have many choices when repairing decayed teeth. In addition to traditional silver amalgam and gold alloy fillings, there are now composite resins and dental ceramics that have come on the scene, which are extremely durable and equally beautiful. These materials can also be used to create restorations that are virtually indistinguishable from natural teeth. Fillings do exactly what the name implies: they seal small holes in your teeth, usually from cavities that are caused by decay. Sealing the hole prevents the decay from spreading further into your tooth and entering the sensitive inner root – a condition that requires root canal treatment. Before any work is performed you will be anesthetized so that you will not feel any pain. Although we normally use numbing injections, there are other options available if needed. The process of filling a tooth begins with an examination and review of x-rays to determine the extent of the decay. Next, we will remove the decayed portion of the tooth, usually with a dental drill or similar handheld instrument. After the decay is removed, the tooth is cleaned of all debris, and the filling material is applied and formed. Amalgam — The classic "silver" filling in use for more than a century, dental amalgam is actually an alloy made up of mercury, silver, tin, and copper. The mercury combines with the other metals in the amalgam to make it stable and safe. Cast Gold — Among the most expensive restorative dental materials, cast gold combines gold with other metals (but no mercury) for a very strong, long-lasting filling. Composite — A popular choice for those who don't want their fillings to show, composites are a mixture of plastic and glass, which actually becomes bonded to the rest of the tooth. Porcelain — These high-tech dental ceramics are strong, lifelike, and don't stain as composites can. When the damage done to a tooth by decay is too extensive to be treated with a simple filling, yet not significant enough to need a full-coverage crown, the best solution may be an inlay or onlay. These fillings are fabricated outside the mouth (usually by a dental laboratory) and then bonded to the tooth by the dentist. 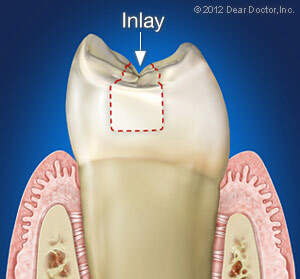 It is considered an "inlay" when the filling fits within the little points or "cusps" of a back (premolar or molar) tooth (View Inlay Example). It is an "onlay" if it covers one or more of these cusps (View Onlay Example). In order to receive an inlay or onlay, the tooth and surrounding area must be numbed with a local anesthetic and the decay removed. We then take an impression of the tooth, either digitally or with a putty-like material, and send it to the dental laboratory, where the inlay or onlay will be made. We will attach a temporary filling to your tooth to protect it until the permanent restoration is ready. At your next visit, the permanent inlay/onlay will be attached to your tooth with either a resin that hardens under a special curing light, or a type of permanent cement. Inlays and onlays are strong, long-lasting, and require no greater level of care than any other tooth. Want to Schedule Your Appointment with Dr. Dixon Today? If you are considering a restorative procedure, or have any other questions about your dental health, schedule an appointment with us today! Dr. Dixon and his team strive to offer Grove City and Columbus, Ohio a wide range of premier dental care, including general family dentistry and cosmetic treatments. We look forward to meeting you!